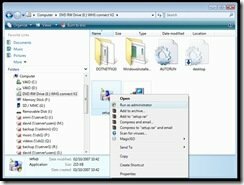 When installing the Windows Home Server connector software the server may not be found. This may be because you are running as a restricted Vista user and if this is the case you will need to install the connector software as “Administrator”. The step by step instructions are on Tranquil PC’s Weblog. I am having problems installing the connector on a Vista laptop. When performing the install it completes as far as Finding the Home Server, at which point the Connector Install hangs (unresponsive). It does not timeout to say it cannot find the Home Server. The WHS server is an OEM install and all the latest updates have been applied. It does not have the default name of SERVER but has been configured to be in the MSHOME workgroup. I have installed the connector succesfully on four other PCs, two XP Home, 1 XP Pro and 1 XP Tablet. All the PCs have Norton Internet Security, with most being at 2008. For the testing the firewall and intrusion protection was disabled on the Vista machine. The WHS server can be accessed remotely. 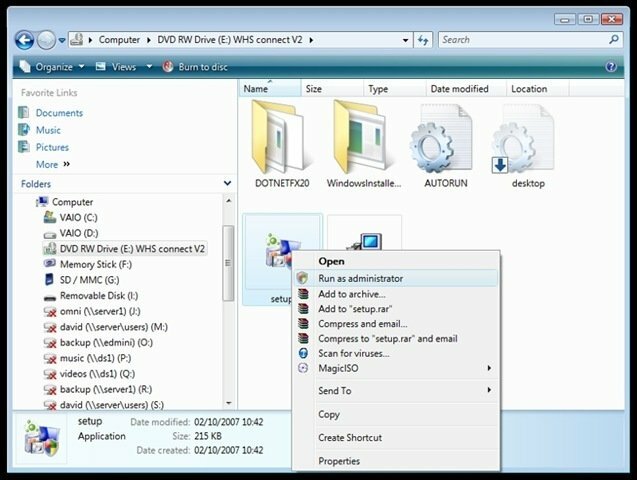 The Vista laptop can access the server through a Remote Desktop Connection (with a certificate error) and can also access the server shares. I have tried to re-install the connector several times, both from the CD and from the Software share on the WHS. I have also attempted troubleshooting using the Connector Troubleshooter in the advanced configuration, and the whs_connect_tshoot.doc. Using the trouble shooter the XP boxes pass all the tests. The Vista box fails the EnrolId 56000 id.xml tests. From the tshoot document section on firewalls I have tried browsing https://:56000/enroll/id.xml. This brings up a certificate error. Proceeding past the certificate error gives the correct response 2. The certificate error is because the certificate does not have a trusted certification authority (there is no path to a trusted root). The Resolution section in Microsoft Knowledge Base article 939218 has been followed but this has not resolved the issue. As the WHS has been updated it does have a trusted certificate (GoDaddy) for remote access and the WHS can be accessed from the WHS homeserver.com URL. The Windows Home Server Connector Service is running on the Vista PC, and the Vista PC correctly resolves the WHS name when pinging. From the above it appears the installation is succesful but the discover fails, is this correct? Does the Discovery rely on EnrolId 56000 id.xml being succesful without certificate issues. If so it seems the update described in KB941914 will always cause it to fail. What does the wWinMain failed error in the discovery log imply? Are there any know issues relating to connecting from a Vista machine? Exactly the same case with me. Hellooooo Microsoft, can someone post an answer pls!